Image caption Colombian delegate Marcela Duran said both sides had successfully reached an agreement on a bilateral ceasefire. The Colombian government and the Farc rebels say they have agreed to lay down arms as they approach the end of historic peace talks in Havana. In a joint statement, the two sides said they had reached agreement on a bilateral ceasefire and how disarmament would take place. The details will be made public on Thursday. On Monday, the Colombian President Juan Manuel Santos said a final peace deal could be signed by 20 July. The final deal will end five decades of armed conflict in which an estimated 220,000 people have been killed and almost seven million displaced. 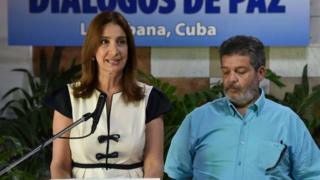 Speaking in Havana, where peace talks have been taking place for more than three years, Colombian government spokeswoman Marcela Duran outlined what had been agreed. "The national government and Farc delegations inform the public that we have successfully agreed a definitive and bilateral ceasefire, the laying down of arms, security guarantees and the fight against organised crime units." Farc commander Carlos Lozada wrote on Twitter: "So that this horrible night may end and the path of peace and light may open, on Thursday 23 June we will announce #thefinaldayofthewar." The agreement on the bilateral ceasefire resolves one of the final points of the peace talks and leaves only one other issue to be resolved. The negotiators have overcome one of the biggest hurdles on the road towards a final peace deal. They had already agreed on rural reform; tackling the illicit drugs trade; the rebels' political participation; and how crimes committed during the conflict would be dealt with. In this latest agreement, the two sides have committed themselves to stop using their weapons for good by entering into a permanent verifiable bilateral ceasefire. It comes almost a year after the Farc declared a unilateral ceasefire, which resulted in a significant drop in levels of violence. That move was followed by the government halting air raids on rebel camps and a de-escalation of offensive action by the security forces. This latest agreement goes further as it will result in the disarmament of the Farc, who will now have to trust state forces to protect them from their enemies, of which they have many in Colombia. Both sides still need to establish how the peace deal in its totality will be implemented, verified and approved. The governments wants to put the deal to a popular vote so that the Colombian people can have their say. Farc negotiators have said they would prefer to call a constitutional convention to incorporate the deal into Colombia's constitution. The meeting on Thursday will be chaired by President Santos and the leader of the Farc, Timoleon Jimenez. They will be joined by UN Secretary General Ban Ki-Moon, Cuban leader Raul Castro and the Norwegian Foreign Minister Borge Brende, who are representing guarantor countries. The presidents of Chile, Michele Bachelet, and of Venezuela, Nicolas Maduro, will also be there as well as representatives from the US, the European Union and the presidents of El Salvador and the Dominican Republic.